The pilgrims coming to the dedication brought with them jars, sometimes with great difficulty, filled with their contributions. The return current of jars. "Fill the jars with love for the Church!" A shrine overflows with love for the Church. When a severe earthquake shook Chile in the Spring of 2014, the jar from Bellavista was placed in "the shrine of all of us". When he looked into it one of the youth discovered a few bits of paper at the bottom. They were the slips of paper on which contributions to the capital of grace had been recorded almost ten years previously for the dedication. Suddenly the connection with Chile became more personal, more vital. Life was flowing to and fro; there was mutual give and take. 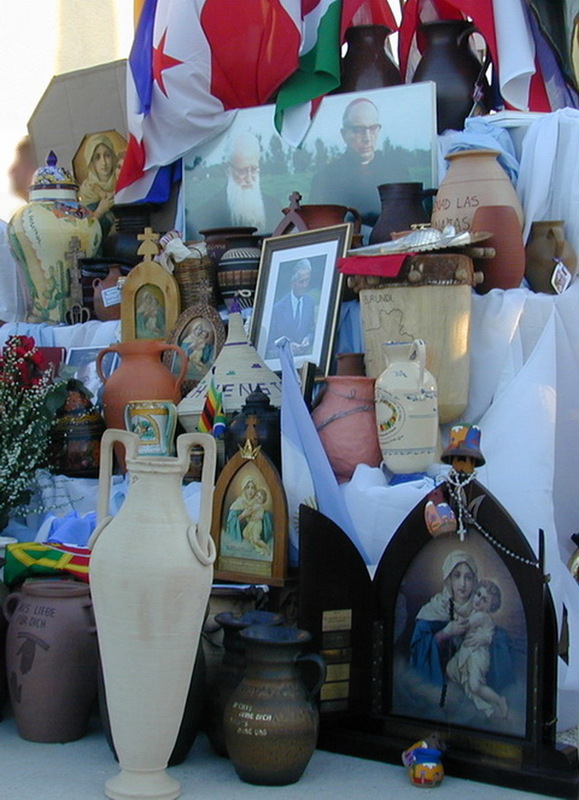 Many of the jars brought to the dedication in 2004 remained in Belmonte and have been given a place of honour in the Casa dell'Allenza. Time and again a different jar is place in the shrine to connect it with the country from which it came. Some visitors are surprised to find a Cholita, a typical earthenware jar from Bolivia, in a shrine in the middle of Rome – or a basket from Burundi, a jar with a picture of Our Lady of Guadalupe, or with Portuguese lettering. Suddenly they understand that this is not in a German, or Italian, Schoenstatt Centre, but one that is international. In the heart of the universal Church. The shrine of all of us in Belmonte is the only shrine in the world that was given jars from many countries and shrines on the day of its dedication as a visible expression of their contributions to the capital of grace. "A group of around thirty people set off from our country on 4 September on the way to Rome. We took along our national flag, the visible signs of our preparations, and the jar filled with many contributions to the capital of grace. It is to remain forever in the shadow of this new shrine as a sign of our union with the Church and testimony to our commitment to the Church. A safe journey to all! The Mother of the Church awaits us! Let us also pray for a good trip for this jar and the many others. Just as the pilgrims from Argentina did, who travelled to Schoenstatt with a number of jars! They can still remember the moment when the security official at the airport suspected that the box with the jar from Concepción, Uruguay, contained a bomb ... and then in the fullest sense of the word pulled out a handful of contributions to the capital of grace ..."